The new and groundbreaking Elevation Series from Ice-O-Matic is designed to simplify life. The cube ice machines are easy to clean, easy to service, simple to operate, and environmentally responsible without sacrificing productivity. 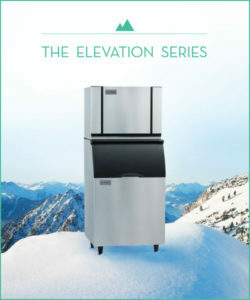 The Elevation Series provides clean, dependable ice from an astonishingly user-friendly and energy-efficient machine. The Elevation Series is an enhancement and re-commitment from Ice-O-Matic to be responsible environmental partners. Like you and your customers, everyone at Ice-O-Matic takes environmental stewardship seriously. In their Colorado factory, they recycle everything from oil to scrap metal to light bulbs. In the field, they have partnered with the American Forests and Global ReLeaf Initiative, which allows IOM to offset our carbon footprint by 40%. In Elevation Series ice machines, BPA-free plastics are used, parts are recyclable, and digital controls rigorously monitor energy use. The entire Elevation Series meets or exceeds 2018 Department of Energy regulations. Exclusive, groundbreaking technology offers a completely unique solution to the problem of hot-air discharge clearance: Dual Exhaust. Standard on every Elevation Series unit, it’s built to accommodate both top-air discharge and side-air discharge. Regardless of airflow requirements, the Elevation Series adapts to your needs and make sure you get the most from your space. Since every Elevation machine is designed to provide both side- and top-air discharge, there is no need to stock additional inventory. We all know what a headache servicing your ice machine can be. Whether it’s long wait times, expensive onsite calls from technicians, or difficulty finding experts in rural areas, a broken ice machine breaks the bank. That’s why Ice-O-Matic designed the new Elevation Series ice machines to be the easiest to service yet. The plug-and-play design requires minimal installation; plus, it makes servicing a breeze. In fact, the Elevation Series is so intuitive, the operator can often keep the machine operational without calling a service technician. Universal Smart Harness™ control board makes servicing machines elementary. Ice is food. Not only does the cleanliness of your machine impact the taste and smell of ice, but it also has serious consequences for the health and safety of your customers. An improperly maintained ice machine carries the risk of foodbourne illnesses. IOM recognizes how crucial it is to keep your machine sanitary, and your business safe, so it designed the Elevation Series to be easier to clean and stay cleaner longer. The seamless food zone is sealed from all mechanical hardware, meaning nothing contaminates the area where ice is produced. When it’s time to clean and sanitize your machine, the Food Zone is smooth and crevice-free for thorough, long-lasting sanitation. Plastic Food Zone eliminates hard-to-clean nooks and crannies, allowing for effortless operator wipe-down and easy, long-lasting sanitation. Smart LED light indicates when cleaning is required, and the unit features one-touch cleaning with sanitizing and de-liming. Features BPA-free snap-in/snap-out dishwasher-safe components. Check out our full line of Ice-O-Matic products and take your ice machines to the next level with the Elevation Series from Ice-O-Matic at Burkett!